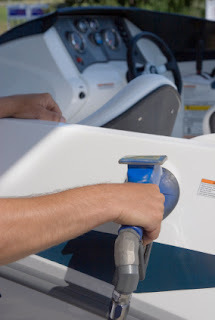 Improving Your Fuel Efficiency on the Water. Now, I’m the first to say, “You’ve got a $30,000 boat tied to the dock and you’re fretting about $200 in fuel? Wassup, doc! ?” But, with that said, “Waste not, want not!” and this column is about that. Your prop is the next most important item to tune. “Tune up my prop?” you say? Yes. If your prop (pitch) is too large for the boat, you are wasting energy. Wait – it came with the boat as original equipment. How can it be too large now? Simple – as the boat gets older (i.e., heavier), the prop’s “pitch”, i.e., how far the boat goes with one revolution of the prop, has to come in order for the engine to still match the pitch and distance. But wait. I have a 25’ boat and she goes considerably faster than 6.7 knots. How? She uses horsepower to defeat the physics of the “hull speed” equation – also known as the “displacement speed” equation. As our power boats go faster, the “V” comes up OUT of the water – we convert from a displacement vessel to a “planing” vessel. But at 6.7 knots, I’m burning 2 gallons an hour. At 25 knots, I’m burning 10 times that but only going about 4 times as fast. It can get very complicated from here when we start talking about bow waves and stern waves interacting and the trim of the engine versus the waterline of the boat, etc. Suffice it to say this: You’ll use less fuel at 20 knots than at 25 knots and you’ll use less fuel at all speeds if you REDUCE your wetted surface (trim the bow up a bit (experiment at a fixed prop speed to see what your speed-over-the-water does at a given prop speed)) by using your trim tabs – and reducing the weight of the boat (back to the basics!) so the “V” doesn’t sit so deeply in the water naturally.